"Hans Pfitzner was one of the composers who carried the German Romantic tradition well into the 20th century. Unlike those of his contemporaries Mahler and Richard Strauss, his reputation never seemed to extend beyond the borders of his homeland. Yet there is much that is individualistic and much to admire from his body of work - particularly in his best-known work, the opera PALESTRINA. 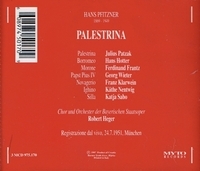 The crown of Pfitzner's work is arguably his opera PALESTRINA (1915), based on the life of the Renaissance composer and quoting passages of that master's music. Pfitzner may have seen himself in the opera's protagonist, as a man who, sticking to his principles, upholds musical tradition against the depredations of power. (The opera treats the legendary effort on Palestrina's part to compose a work beautiful and spiritual enough to foretell the banning of polyphony under consideration by the architects of the Counter Reformation.) Also noteworthy is Pfitzner's cantata VON DEUTSCHER SEELE (Of the German Soul) of 1920. Both works are in the highly chromatic, richly sonorous tradition of post-Romanticism, and could never be mistaken for mere throwbacks to the 19th century. Although the Romantic revival of the 1960s did not do for Pfitzner what it did for many of his contemporaries, there is much of his output worth hearing. At his best, Pfitzner spoke with the eloquence and intensity of one who consciously lives during the close of a glorious era." "On April 30, 1945, 'zero hour', in Garmisch-Partenkirchen, while American G.I.s paid their respects to Richard Strauss, Hans Pfitzner was living with his second wife in a single room in a makeshift hospital. Pfitzner, once Strauss's most determined rival, was now linked to anti-Semitic, Nazi polemics. His musical attempts were a pastiche of century-old Romanticism, with only an echo of a once formidable personal style. Strauss, since his death in 1949, has only increased in fame. Pfitzner, who died the same year, remains in limbo. His opera PALESTRINA is usually described as a masterpiece, but it is seldom heard." "Most collectors will prefer [Patzak's] Mozart discs as the best representation of his voice. Patzak has left behind some beautiful performances, not to mention the many delightful operetta discs, and Heurigen songs. Also, in the field of oratorio and Lieder, he was ahead of his rivals, and probably the leading tenor of his epoch."